Citation Information: J Clin Invest. 2013;123(5):2049-2063. https://doi.org/10.1172/JCI65634. Increased DNA damage leads to ATM activation and p53-dependent apoptosis in the Atrx-null embryonic brain. 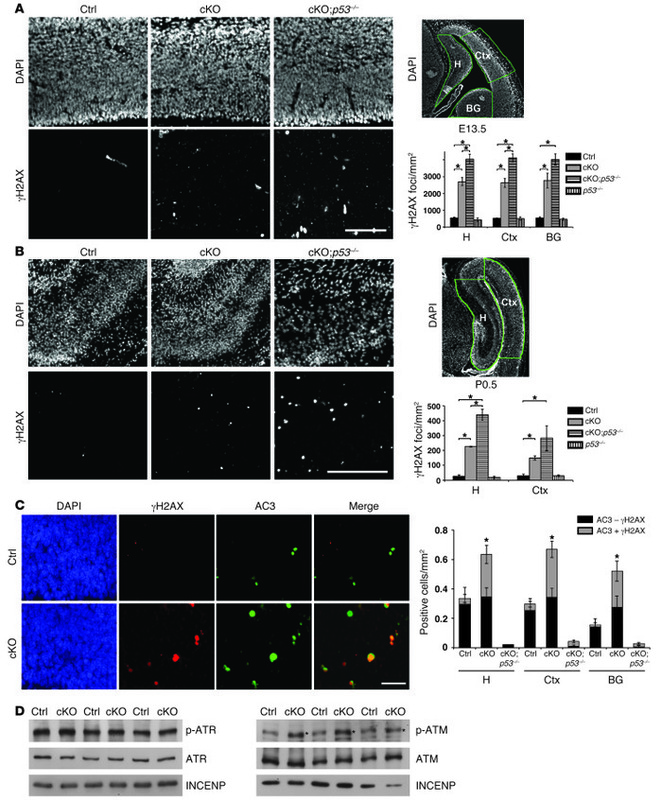 (A) Immunostaining for γH2AX in E13.5 control (Ctrl), cKO, and cKO;p53–/– compound mutant cortical cryosections. Scale bar: 100 μm. DAPI staining of E13.5 forebrain highlights in green the hippocampal hem (H), cortex (Ctx), and basal ganglia (BG) regions where γH2AX foci per unit area were scored. Control, cKO, and cKO;p53–/– (n = 3); p53–/– (n = 2). (B) γH2AX staining in P0.5 control, cKO, and cKO;p53–/– cortical cryosections. Scale bar: 200 μm. DAPI staining of P0.5 forebrain highlights in green the hippocampus (H) and cortex (Ctx) regions where γH2AX foci per unit area were scored. Control and cKO (n = 3); cKO;p53–/– and p53–/– (n = 2). (C) Co-immunofluorescence detection of γH2AX (red) and activated caspase-3 (AC3; green) in E13.5 cortical cryosections. Scale bar: 30 μm. AC3+ cells were scored for the presence (AC3 + γH2AX) or absence (AC3 – γH2AX) of DNA damage (n = 3). (D) Western blot analysis of nuclear protein extracts obtained from E13.5 telencephalon (n = 3). While levels of ATR and phospho-ATR were not increased (left panels), phospho-ATM was noticeably increased in the cKO extracts compared with controls (indicated by an asterisk). Original magnification, ×100 (A and B); ×200 (C). *P < 0.05.